Next! We have an exciting bit of news regarding 3 Ghosts’ west coast premiere. 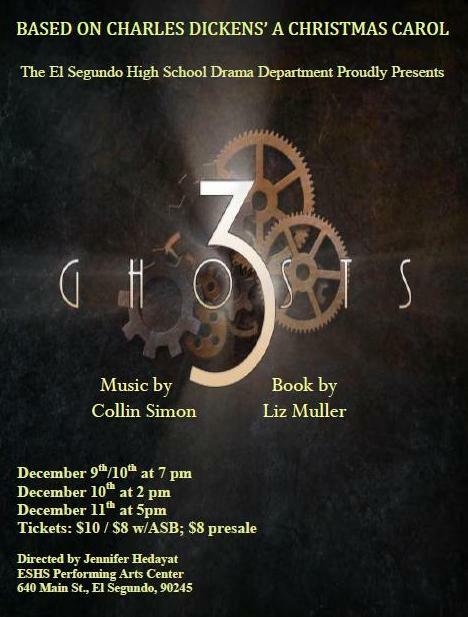 The show is going to be performed by the El Segundo High School in California starting December 9th. That means that the completed version of 3 Ghosts will be simultaneously having its off-Broadway, west coast, and high school debut. Seriously exciting stuff! Annnnnnd since you’re still here reading this may I suggest you also head over to the fan photo page and prepare to fill your daily cute quota. Not for the faint of heart – it’s that cardiac-arrestingly adorable. Hope everyone had a happy Thanksgiving – we’ll see you soon!